You may be wondering about me, my skills, my current activities, my “passions” and so on…. Well! Straight to the point. It was a phrase posted on a mailing-list (unfortunately, with private-archives) on december 2007 by William Stucke. It really impressed me. That’s why I choose to get it as my signature in most of my e-mail. Based on it, I’m going to know nothing about everything. Being lucky enough to live in a wonderful region of Italy, Abruzzo, I like to spend the tiny slice of my free time in countryside, enjoying fresh air and beautiful landscapes. 3G connection, anyway, is a “must”, even during those time. Lots of things could (…and should, BTW) be added but, let’s stop here and publish this very page! P.S. : should you wonder about the photo on top of the page: it’s not, unfortunately, my Ferrari! 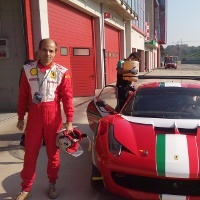 But it was a great pleasure to drive it, even tough for only 4 laps, in Imola, on 2014!